Transtar Travel is no new player in the market. They are a Singapore incorporated company specialising in coach travel and tours, and has been serving customers since 1994. Indeed, they have become one of the leading express coach companies in Singapore, plying routes from Singapore to major cities in Malaysia. Focusing on making passengers experience high quality service, Transtar keep on improving to make passengers feel more comfortable and safe. Transtar is famous among passengers for their good reputation. Transtar’s vision is to be No 1 coach operator in Singapore and their passion can be proven by the many awards that they earned. Z-Club - 3 seats in a single row air-con coach with snoozer seats. Each seats equipped with 7.2" LCD TV, Massaging chairs and Seat Belts Broadcast video system - passengers can choose from 8 different channels of movies program. Meals and coach attendant service are not provided onboard our Z-Club coach service. Premium - 3 seats in a single row air-con coach. (Single & Double Deck) Each seats equipped with 7.2" LCD TV, Massaging chairs and Seat Belts Broadcast video system - passengers can choose from 5 different channels of movies program. 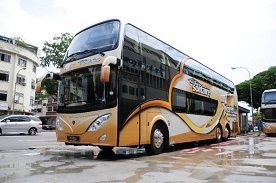 Solitaire - Luxurious Double Deck 2 seats in a single row air-con coach with snoozer seats. Spacious seats with individual 10.2" LCD TV, Massaging chairs and Seat Belts. Video on Demand system - passengers can have full control of their preferred movies (includes Fast Forward / Rewind) where they can choose from a library of over 100 different selections. PC Games. Non-stop trip where meals are being served on board coach.